Born: 25 September 1939 in New York. Education: Studied design at the Fashion Institute of Technology, New York, 1959-61. Family: Married Nancy Cesarani, 1961; children: Lisa, Christopher. Career: Junior designer, Bobby Brooks, New York, 1961-63; fashion display coordinator, Paul Stuart menswear store, New York, 1964-69; merchandising director, Polo by Ralph Lauren, 1970-72; designed menswear and sportswear for Thomas Co. Inc., in Japan; Cesarani shops opened in Japanese retailers Matsuya, Seer, and Tobu, 1972; designer, Country Britches, New York, 1973-75; designer, Stanley Blacker, New York, 1975-76; formed Cesarani Ltd., New York, 1976; women's collection introduced, 1977; company closed then reorganized as Cesarani division for Jaymar Ruby; formed licensing agreements with Hartmarx, 1987-88, Corbin, 1989, Britches of Georgetowne, 1991, and Japan Toray Diplomode; launched leather bag collection for Ace Luggage, 1992; created eyeglass collection for Nanamua Co., 1992; designer/president, Cesarani and SJC Concepts Inc., from 1993; introduced childrenswear collection for Matsuta Co., 1993; designed menswear collection for Thomas Co. Inc., 1994; created men's clothing collection through Panther, a division of Maruben; teacher/critic, Fashion Institute of Technology. Exhibitions: Institute of the Metropolitan Museum of Art, 1995. Awards: Special Coty award for Menswear, 1974, 1975; Coty award for menswear, 1976; Fashion Group award of Boston, 1977; Coty Return award, 1982. Member: Advisory Board of the Fashion Crafts Educational Commission of the High School of Fashion Industries; founding member, New York Advisory Board of the Shannon Rodgers and Jerry Silverman School of Fashion Design and Merchandising, Kent State University, Ohio. Address: 201 East 79th Street, New York, NY, 10021, USA. Website: www.cesarani.com . 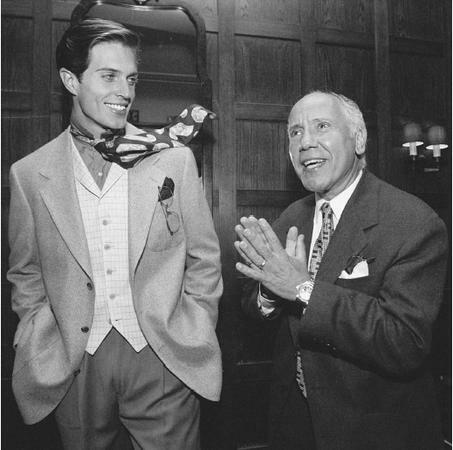 Sal Cesarani with one of his designs from his spring 1996 collection: basket weave sports coat, tattersall Cooper vest, twill pants, silk tie, and chambray shirt. Guerin, Ann, "Spotlight on Sal Cesarani," in Playbill, November 1977. "Sal Cesarani: Tradition Missing," in GQ (New York), January 1982. Staetter, Suzanne, "Cesarani Collection is Just for Certain Women," in the Houston Chronicle (Texas), 12 December 1984. Lane, Dotty, "Cesarani Designs for the International Man," in Record-Courier, 20 August 1993. Boies, Elaine, "Clothes for the Well-Dressed Man," in Staten Island Advance, 3 June 1994. Socha, Miles, "New York's Dean of Good Taste, Sal Cesarnai, is Applying his Spruce Esthetic to a New Range of Sportswear," in Daily News Record (DNR), 14 August 1996. Goldstein, Lauren, "Redaelli Aims to Take Cesarani to the Majors," in DNR, 27 October 1997. "Give Him a Hand," in DNR, 16 February 1998. To the earthbound, Sal Cesarani's menswear might be traditional or even historic. For the dreamer, the wanderer, or the imaginer, Cesarani's evocative and romantic apparel epitomizes and condenses the perfect past. Like a Cindy Sherman portrait, Cesarani's work is seldom a precise equivalent, but gains its power from suggestive resemblance and its ultimate inability to be classified into the past, so powerful are its connections and so focused is its originality. Extracting a nonchalance from American style between the wars and an élan from English aristocracy in its palmier days, Cesarani possesses the power to transport one into a Merchant-Ivory film or to the revery of Golden Age Hollywood. Were Cesarani merely offering history and a wardrobe inventory that is of grandfathers and imagined heroes, we would be respectful, but not captivated. Cesarani's renderings enhance historic designs with subtle change. Cesarani refuted the 20th-century predisposition to believe menswear was mundane. Rather, he gave sentimental spirit to the classic templates of the century's menswear. Having worked both as a designer for Polo/Ralph Lauren and Stanley Blacker, and for a while as a menswear coordinator at Paul Stuart, Cesarani has consistently emphasized styling and the adventuresome ensemble of clothing. Sportswear and tailored clothing, tennis separates, classic tuxedos with the debonair slouches of the 1930s and 1940s, and the looser cuts and drape of Hollywood chic evoking Gary Cooper and Cary Grant characterize Cesarani's style. True, not every man realizes the harmony of proportions of C.S. Bull or Hurrell heroes, but each Cesarani client is capable of some aspiration to such pictorial grace. When he relaunched a tailored clothing line in 1993, Cesarani's Trans-Atlantic collection was not only Anglo-American, but as suggestive as a crossing on the Normandie. Redolent of the 1930s and 1940s, the collection employed separate vests with lapels, pattern mixes of herringbones, glen plaids, and other standard elements for the cool look of the era's styles. What is exceptional about Cesarani is his sense of the fashion composition and modification: the slight eccentricity of a peak lapel on a single-breasted jacket or tartan blazer paired with evening separates evokes memories, but also jostles them, making the clothing fresh again. Key to Cesarani's sensibility, in addition to his Paul Stuart fashion styling, was his work as a design assistant to Ralph Lauren. If Lauren condenses nostalgia into an impacted sentiment more perfect than any real world that has ever existed, Cesarani creates a fictive, movie-star desire, the fantasy of men's clothing and nonchalant style. Like Lauren, his is a study in composition, offering some perfectly regular components as well as a few that suggest special flourish. As a designer, Cesarani has displayed a unique gift for understanding the market: in the 1990s, both his ties and his later tailored clothing came at the right moment for a renewed classicism. The more understated ties then were composed into imaginative ensemble dressing with the grand patterns of vests, mixed slacks, and jackets. "I perceive," said the designer, "each piece of the collection as a component of man's personal style, to be worn and combined according to his own needs." Cesarani invents menswear that is never tedious and his penchant for vintage perfection and superb collection editing is akin to Ralph Lauren's, though Cesarani tends to greater fullness and drape as well as a greater informality and more congenial prices. Cesarani's extensive knowledge of fabric and cut are at the heart of his devotion to expert craftsmanship. In 1997 Cesarani welcomed a partnership with Italian clothing manufacturer Redaelli. Americansold Cesarani clothing, formalwear, outerwear, and neckwear collections are now produced in Milan. In addition to designing clothing, Cesarni's astute sense of fashion trends makes him a sought-after special consultant for major fashion color forecasting companies and special projects, which even included designing ceremonial uniforms for the 1980 Winter Olympics. "My passion is design," Cesarani has explained, to take "a vision, a dream, a fleeting image of the American spirit…and creating something real from it." The integrity of his creations reflect his unerring focus on versatility, elegance, and craftsmanship. Cesarani has continued to be heralded for his imaginative twists on classic styling. In his 1998 collection, he brought together a chestnut glen-plaid vested suit with a burnt-orange plaid cotton shirt and a foulard silk tie. His innovative combinations of pattern and color play together in his own collections but also open new possibilities in any man's existing wardrobe. The elegance in styling evident in clothes bearing the Cesarani label lends them the versatility to be important pieces in an evolving wardrobe for years.